Toyota has improved the value of its top-selling Corolla by up to $2,410 and Yaris by as much as $1,700 by adding features and repositioning prices. These changes apply to vehicles produced from September 2010 with retail deliveries from 18th October. The market leader has turned back the pricing clock five years on the entry-level Yaris hatch at $14,990* (YR 3-door manual) - the same level as in October 2005. Overall, Yaris prices have been revised by up to 5.5 per cent, with the biggest reduction of $950 applying to the YRS 3-door and 5-door hatches. The improved value for these YRS models grows to $1,700 with side, full-length curtain and driver's knee airbags - previously a $750 option - now being included as standard equipment. YRX models also gain the extra airbags. Corolla hatch prices have been reduced by up to 3.4 per cent. The most affordable model, the Ascent manual hatch, now starts at $20,990 - the same as the asking price almost two-and-a-half years ago. In addition to its $750 reduction, Ascent gains the added safety of full-length curtain and driver's knee airbags as well as the extra convenience of rear power windows. All Ascent models now have a total of seven airbags. 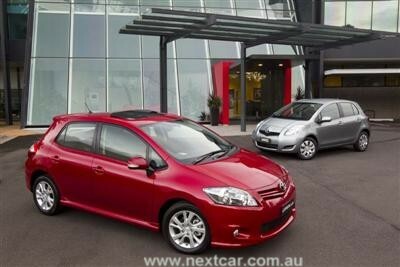 Levin SX hatches are fitted with the extra airbags and also attract a $700 price cut - a value gain of $1,200. Levin ZR hatch prices fall $910 and, with the $1,500 moonroof added to its standard features, the value has improved by $2,410. Conquest hatches gain $2,110 in value with the moonroof and a price cut of $610. Corolla Ascent and Conquest sedans, which had prices lowered with this year's facelift, are also fitted with the same features as their hatch equivalents. Ultima sedan gains the moonroof. Last year, Australians bought almost 60,000 Corolla and Yaris sedans and hatches - 29 per cent of all sales from Toyota dealers. Toyota Australia's senior executive director sales and marketing David Buttner said Toyota was determined to ensure its vehicles were competitive on price and equipment levels. "These moves significantly improve the value of Yaris and Corolla and send a clear signal to customers that Toyota is serious about competing and does not take its market-leading position for granted," Mr Buttner said. "We have been able to make these changes - which represent improved value of up to nine per cent - with the help of our parent company in Japan. Toyota will continue to look for opportunities to offer customers the vehicles they want with competitive prices, competitive specification and competitive benefits such as Toyota's capped-price service - all backed by the quality, durability and reliability inherent in the Toyota brand." Corolla has been Australia's best-selling small car for the past 10 years and was the country's top selling car in July, August and October last year. It is in a close battle for segment honours this year. Yaris (and its predecessor) led the light-car segment for six years from 2003-2008. It was runner-up last year by fewer than 200 units and remains in second place this year. NOTE * Manufacturer's list prices (MLP) exclude dealer delivery fees and state/territory government statutory charges. Additionally, prices, fees and charges are subject to change without notice.